The ACL-8454 is a general purpose timer/counter and digital I/O card for PC/AT or compatibles. It uses the most popular 82C54 timer / counter chip for event counting, pulse measurement, frequency measurement, and pulse generation. 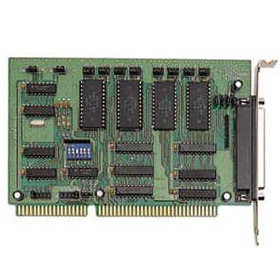 In addition, 8 digital outputs and up to 16 digital inputs are supported on this card. On the ACL-8454, two 84C54 chips are on board and up to four 84C54 chips can be supported. It provides at least six and up to twelve 16-bit down counter. Each counter can be configured as a different clock sources and gate control by the jumper selection. CLK period: 125 ns min. Input low voltage: -0.5V min., 0.8V max. Input high voltage: 2.0V min., VCC +0.5V max. Output low voltage: 0.45V max. Output high voltage: 2.4V max.